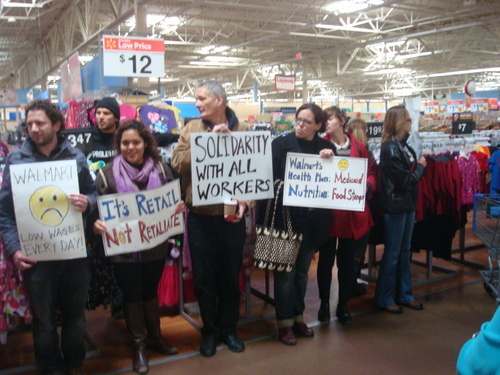 This week, OUR Walmart, the union-backed association that Sparks joined, has been holding demonstrations in Bentonville, Ark. — Walmart’s headquarters — leading up to the annual shareholders’ meeting on Friday. The group has gathered workers from around the country to share stories about their experiences, educated workers about their rights, and organized a series of strikes and protests, including last year’s widely publicized demonstration on Black Friday. Posted in Power/ResistanceTagged activism, bullying, unions, WalmartBookmark the permalink.